Divided into two folders. Folder 1 has media coverage of McIntosh visit to New Zealand in Feb 1977; folder 2 has background articles, including copies of Timor Information Service up to end 1976, copy of Helen Hill's The Timor Story, and Australian media items on Timor for Jan-Feb 1977. 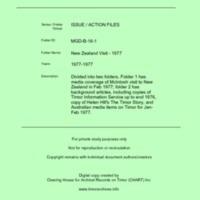 “New Zealand Visit - 1977 [MGD B16],” CHART DIGITAL, accessed April 18, 2019, http://chart-digital.info/items/show/643.